A really splendid quality CARLTON WARE large dish. 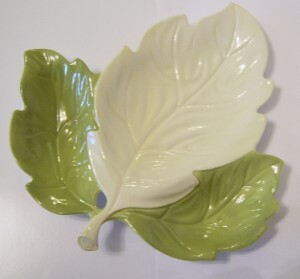 It is vintage Australian Design, handpainted from their Leaf Salad Range. It dates from the 1955-1958 period. It has a two-tone colouring on the top side with a plain white gound underneath. The colours are a light/medium green with a central colour of pale green. It is backstamped and had the impressed pattern number 2377. It measures 10.5 inches (26 cms) in length with a maximum width of a similar size. It is in perfect condition with no chips/nibbles nor visible wear and tear.